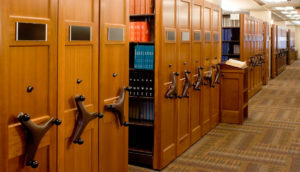 BSC library products such as the ScanPro, Book Scanners, and Mobile Shelving give libraries the ability to preserve the value of their records and bound material. Business Systems & Consultants is a premier provider of storage and digital solutions. Since 1976, we have worked with clients to provide economical, space efficient, and productive storage systems, as well as digital conversion solutions. Our experienced and knowledgeable staff will consult with you to understand and design a solution meeting your requirements. Our conversion staff know how to handle each document or record, digitizing your media whether paper or microfilm. The result: high quality records produced by the most advanced scanning equipment and software in the industry such as the ScanPro and Book Scanner. We have the volume to transfer all types of documents, bound material, or microfilm. 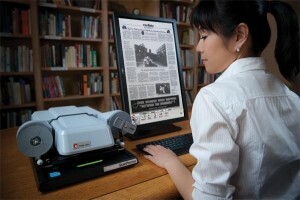 The ScanPro: Microfilm scanners such as the ScanPro are used to preserve archives and speed up retrieval time. When you digitize your archives the process consists of loading film and quickly capturing all the content and information on the roll of microfilm within minutes. From this point you can easily save everything you’ve converted so you can go back to it at any time. This offers you security to specific items and easy retrieval whenever you need to gain access to those items again. 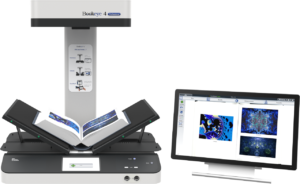 Book Scanners: BSC has the capability to install, maintain, and provide a simple operation with the highest productivity of book scanners. The book scanner is suitable for digitization projects that require high quality and maximum productivity even in 24/7 operation. Books, magazines, posters, folders, or bound documents of all types can be digitized at high speeds and a resolution up to 600 dpi results in using our scanner. Mobile Shelving: Books, journals and periodicals exist in hard copy, electronic and microfilm formats. Mobile storage systems are the best solution for managing a growing collection and preserving the value of each item. Ask a BSC representative about our mobile shelving solutions. When you decide to transfer your hard copy items to an electronic format you want to be sure you are storing them correctly and having an electronic form of your valuable items saves the chances of your items getting destroyed by natural disasters. Ask a BSC representative about our scanning services today. Contact us at 205-988-3300 or email us at info@bscsolutions.com for more information on our library products and services.